You want a floor that’s more than just gorgeous: you want it to be affordable, too. That might seem impossible, but you can get exactly what you want with vinyl. Sheet vinyl flooring comes in large sheets that are glued to the subfloor. Carpet In Motion has a variety of vinyl flooring options, and our mobile showroom can come to your front door. You can also visit our 2,000 square-foot showroom to see additional samples. Are you still not sure if vinyl is the right choice? Look at the reasons that so many people are going with sheet vinyl when upgrading their floors. Then, contact our Denver vinyl experts to take the next step. You don’t want to spend a ton of money on flooring, so consider going with vinyl. The materials are cheaper than other flooring options, and it also holds up over the years. That makes it a sound investment. If you go with a wood floor, it’s going to look like wood. The same is true with tile: Tile looks like tile. Vinyl offers something a little different, though. You can find vinyl in various patterns and designs, allowing you to replicate the look you want without the cost. 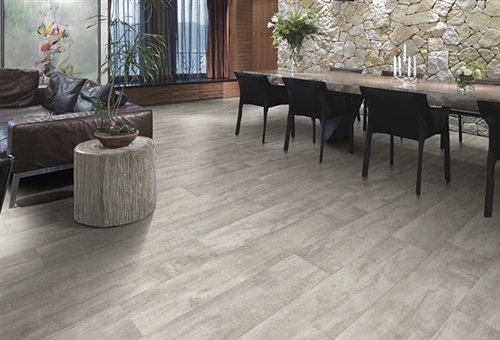 Whether you want something that looks like wood planks, ceramic tile, or something else, you can find the look you desire. Also, because sheet vinyl is typically installed without seams, it will look just like the real thing. Did you know that sheet vinyl is performance rated? That means you know how the vinyl will hold up before you install it. You can easily find sheet vinyl that is highly durable. Your kids and pets can trample on it without any worries. The team at Carpet In Motion is happy to help you find a sheet vinyl option that has the performance rating you need for your lifestyle. Then, our Denver vinyl installation experts will install it in your home. Do you need a floor for the bathroom? Sheet vinyl will work. What about the living room? Again, you can use sheet vinyl. This floor can go anywhere and everywhere, and it can even be installed on top of any available subfloor. Talk about a flexible choice. If you want something that’s easy to maintain, it’s hard to beat vinyl. It is waterproof so you don’t have to worry about it buckling after a spill. Plus, it’s super easy to clean: Just sweep and mop your vinyl floor and it’ll look like new again. Wouldn’t it be nice to fill your lungs with fresh air every morning? You can do just that with a vinyl floor. It retains fewer allergens than other types of floors, so you’ll breathe easily with this one. Tile floors tend to get really cold, while stone floors often heat up when it gets hot inside. Vinyl floors maintain an even temperature, no matter what is going on with the weather. That means you can walk around barefoot without any issues. Now that you know vinyl is a good choice for your home or business, it’s time to schedule a free estimate. Carpet In Motion can come out to your home in no time and provide you with a cost-free estimate before moving forward with the installation.